The next day, we visited a mate of Brandon's for a traditional Namibian braai (essentially a barbecue). The only difference is that a pile of fresh wood is first burnt in the preparatory area, and allowed to burn until it's turned into hot charcoal. This coal is then spread across the base of the barbie for cooking. The beauty of this approach is that you only need to spread enough coal to cover as much cooking area as needed. 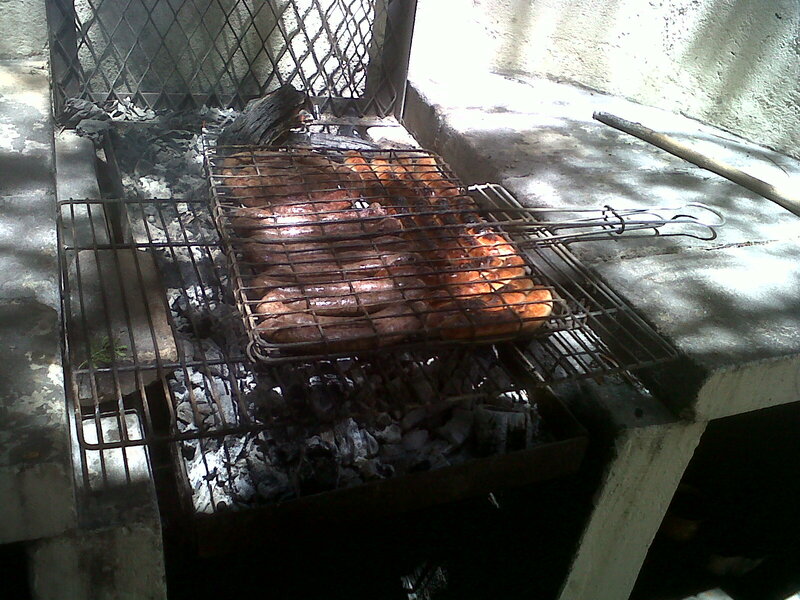 There are a few different versions of braai - the one pictured here is more basic, but still effective. The best thing about this is that all of the meat is firmly secured in the grille thingee, so you can turn everything over in one fell flip. 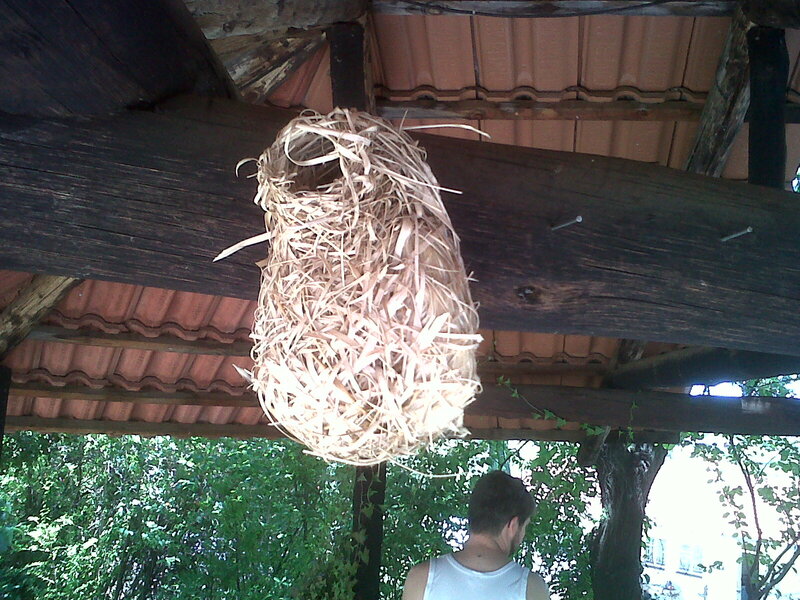 Here's an interesting bit of trivia - a weaver bird's nest hanging in the pergola housing the braai. These things are all over the place in Namibia - single trees can be festooned with the nests. The interesting thing is that most of them are uninhabited. 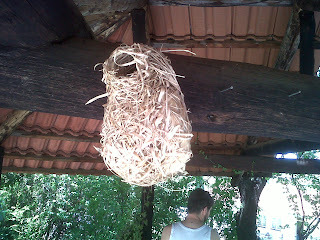 The male weaver bird runs around collecting material to make a nest, which is then inspected by the female weaver bird. If it doesn't pass muster, he gets the flick and must build a new nest and try to impress the same bird or a new one. If the female bird likes it, then they hook up and she moves in. Kind of like humans, really. 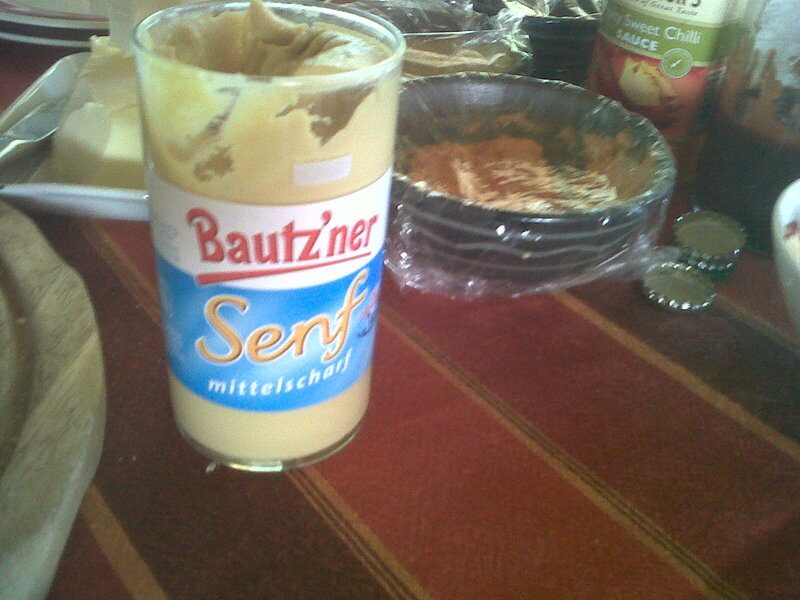 Anyway, back to the food! One might think it strange to be enjoying a Namibian braai with a bunch of Russians, former East Germans and even a Czech - no Namibians present at all. But some of these folks have been living here for a while and are experts at the whole braai preparation thing. 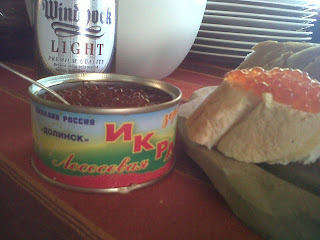 And you get some fantastically exotic foods thrown in with the already exotic fare - Russian red salmon caviar (sadly, it's apparently illegal to export sturgeon caviar) and East German mustard (which strangely tastes just like any other mustards - apparently the distinctive flavour has been affected by West German interference in the manufacturing process). Krasnaya ikra, as we found out, is best eaten on a slice of freshly baked french loaf that has first been liberally slathered with soft butter. 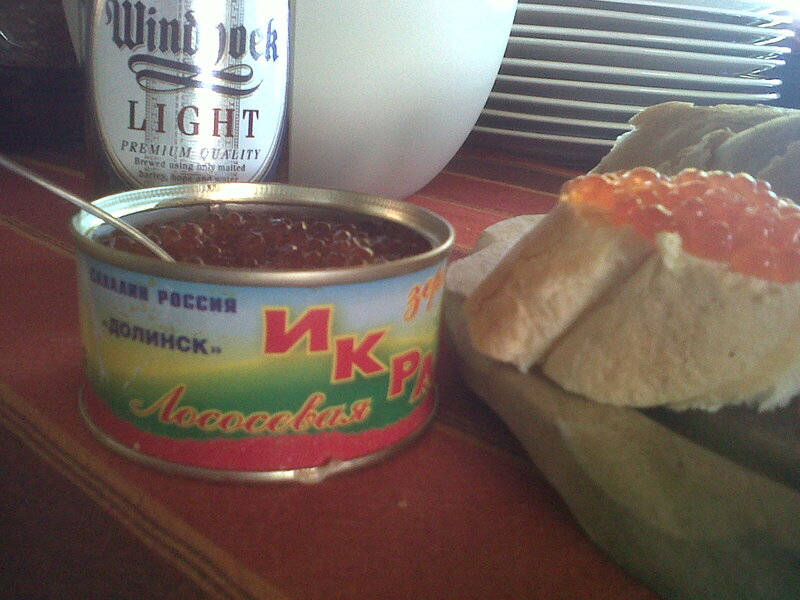 The butter and bread serve as a counterbalance to the very salty roe. I can attest to the fact that this approach enhances the eating experience! We enjoyed a range of meats, including boerwors, bratwurst, oryx and kudu steaks! The oryx was the highlight - tender and juicy. 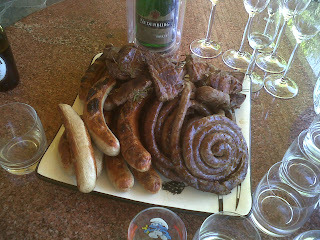 All washed down with delicious South African sparking - Nederburg Methode Traditionelle. Dry with nice mousse, a tinge of fruit, not too much yeast, with a refreshing crisp finish. Of course, one cannot just drink sparkling wine with a barbie, even in a different country - the mandatory beers had to be consumed as well. Namibia has a great range of these. The most recognisable of these would be Windhoek. There's Lager, Draught and Light. All are tasty beverages. Even the light beer (as one knows, light beers almost always taste awful).